Back in those days, as most of the Dayaks are farmers and most farms are on the hilly parts or at the foot of the mountain, they normally will start their day as early as 6am to start their journey from home. This is so that they can start tending on their farm and utilized the cool temperature in the morning to do as much as they can. Because of that, they normally will have only a very light breakfast which consists of a grounded coffee and accompanied with cream crackers or quick fritters either at home or at the farm. Lunch also normally was not a fussy affair. Normally each farm owners shall have a small hut for them to rest or cook. When the sun started to become too hot to bear, they will slowly started to collect some of the vegetables that they have planted within the farm. These shall be cooked either on open flame, stir fried or soup. The source of protein shall normally be either fermented wild boar, pork, fish, dry salted fish or food that they can keep in the hut without any refrigeration required. This shall also includes freshwater catch from a nearby stream. All food preparation is kept to a minimum so that they can get their midday rest and start back their work once the hot sun is bearable enough. As the source of vegetables are aplenty, this is why you can find more vege dishes in their diet, up to this day. One of the common vegetables which is easy to be prepared on the farm and really tantalized the taste bud is the grilled eggplant with sambal belacan. Eggplant grilled on open flame produced a wonderful and sweet smokey aroma and it is what make this dish so special. 1. Grilled eggplant on open flame, gas stove or in oven. 2. When the eggplant is soften and fragrant smell come out, it's ready. 3. 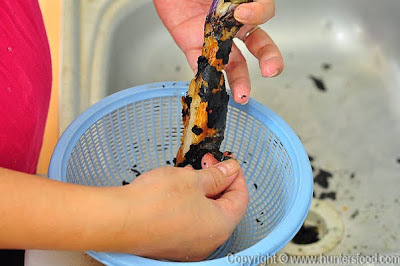 Peel off the burnt outer skin by pouring some water to cool it down and it'll make the peeling of easier. 4. Mix warm water to the sambal belacan to form a paste. 5. Shred the cooked eggplant with your finger, or cut using knife. 6. Stir the sambal belacan with the eggplant. And it's ready for consumption! ku slalu nai tih..samal sorai biban og?he3..
lama x makai tok huhu..
Adoh..tuui manah2 boow komen tih..he3..mok puan ngan mei oni d nang nyaa sorai biban neh? Haha.. yohleh. Sorai biban noh pucuk sayur wangi doh? Krieng nang pokok kewangi. Slalu koih man ulam watnoh sija, atau sapur sijak daang samal biing. Haa..bonar leh noh..ku search google pun mmg sorai biban ku pic..hahahaha..noh sedap mun sapur daang labal tiung asuam..pas2 sijak ea odp nyek jauh sok kupuak..he3.